Splendid Play is a fun company that was created by a mother of 2 fun and inspiring girls. This mom is busy having fun with her two daughters that often times the play helps create new ideas that she creates and sells in her Etsy Store. Her girls test each product so you can be sure each thing is kid tested and approved! A few items that you can find in her shop include: reversible crowns with fun characters such as Brave, My Little Pony, Bat Man, Pirates, Stripes, monkeys, and many more, Monster animals that are very adorable, key chains, monster tail, very cool "Eye Spy" busy bags, and many other items that I imagine your children will love. Thank you Splendid Play for supplying me with a Brave/My Little Pony crown to review. Also thank-you Splendid Play for supplying a discount code and FREE shipping to Praises of a Wife and Mommy readers! :) All opinions are 100% mine. Shipping was very quick and the packaging was simple. On one side of the crown we have Brave theme and the other side is My Little Pony. I opened the package while my daughter was napping. When she woke up she spotted it on the coffee table and had the cutest reaction. 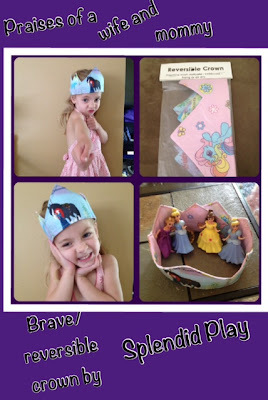 She took a big gasp and asked in a very excited tone, "is that Brave crown for me?" When I said yes she was jumping up and down and put it on. My daughter did go see Brave in theaters so she has kept the Brave facing out. :) The crown is adjustable with Velcro and the Velcro is long enough to adjust to fit me too! :) :) Yep, I have had the crown on a few times. Another item that Splendid Play has that I am very interested in having for our long road trip is their "Eye-Spy Bags." These bags are fantastic for keeping kids occupied for car trips, flights, and even waiting for food at a restaurant. They're great for a variety of ages- with times pictured on the attached card. They're great for teaching words association too since the pictures are paired with their written description on the card. They are super lightweight and easy to carry, hold and mush for even the tiniest of hands. Each bag is filled with small hidden items and a non toxic poly pellet. Every bag is reinforced and double stitched closed in an effort to hold up to the punishment your kids will undoubtedly deal out while trying to find each hidden item. SO go check out Splendid Play Etsy and Like them on Facebook! Right now they are offering FREE SHIPPING and since you are reading this you can get 20% off by entering in this coupon code during check out: 'PRAISES20.' YAY!!! Have fun shopping!